Today the Washington Post brings you another example of scary biased reporting. Today’s article by Michael Waldman and Justin Levitt discusses the “alleged” voter fraud problem in this country. And, that finding voter fraud is as likely as finding Sasquatch! Allegations of voter fraud — someone sneaking into the polls to cast an illicit vote — have been pushed in recent years by partisans seeking to justify proof-of-citizenship and other restrictive ID requirements as a condition of voting. Scare stories abound on the Internet and on editorial pages, and they quickly become accepted wisdom. Interesting that the authors talk about the close Washington State Gubernatorial Race in 2004 but don’t mention the fact that there were more votes counted in King County than voters who live there. Funny they fly over the St. Louis region where at least 16 democrats were arrested, convicted and sentenced for election crimes (and attempted murder of a federal witness) following the 2004 race alone… But, no Yeti sightings. Election officials launched an investigation in 2004 after noticing that among the “new” voters registered was longtime Alderman Albert “Red” Villa, who died in 1990. His bust stands in South St. Louis. Local democratic operatives were hoping to revive his career. In Missouri alone, prior to the 2006 elections, ACORN workers were indicted for turning in 35,000 questionable registration forms! 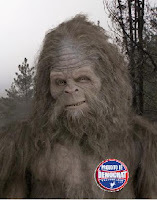 Sorry, WaPo… Sasquatch may not have visited the polling stations Yet(i), but despite your biased reporting, there are oodles of democrats sentenced and convicted for voter crimes!